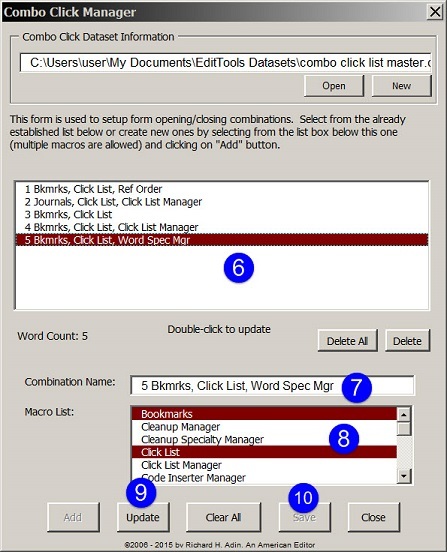 Combo Click is a quick way to open more than one EditTools dialog simultaneously. 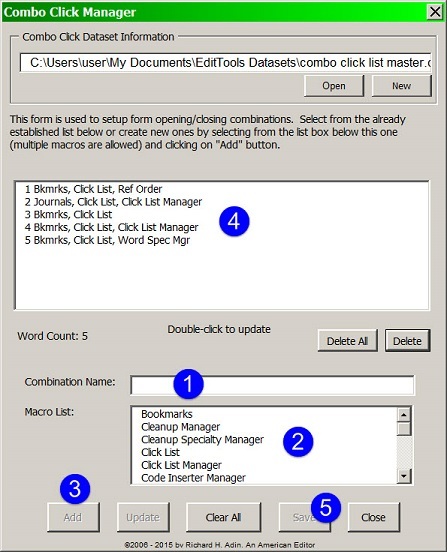 For example, if in a project you find that when you open a file for editing that you also are opening the Bookmarks, Click List, and Word Specialty Manager dialogs, rather than opening each individually, you can use the Combo Click Manager to create a combination for that trio that you can click on to open all three simultaneously. When you have selected all of the macros you want included, click Add (#3). Your new combination will appear in the main field (#4). If you click Save (#5), your combination will be saved and will also appear in in the Combo Click dialog so it can be used. If you have an existing combination that you want to modify, double-click on its name in the main field (#6), as shown below. The name will automatically appear in the Name field (#7) and the names of each of the included macros will be highlighted in the Macro List (#8). Make your changes — change the name, add or remove macros — and click Update (#9), then Save (#10). Click on any of the combinations you have created (#11) and those dialogs will open. You can also access the Combo Click Manager by clicking the button at #12. 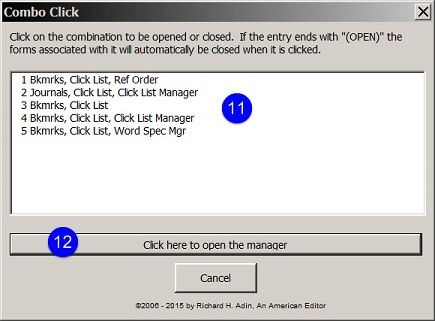 The Combo Click dialog will automatically close when you click on a combination name.